In what could set the stage for a fundamental shift in commercial aviation, an MIT-led team has designed a green airplane that is estimated to use 70 percent less fuel than current planes while also reducing noise and emission of nitrogen oxides (NOx). The design was one of two that the team, led by faculty from the Department of Aeronautics and Astronautics, presented to NASA last month as part of a $2.1 million research contract to develop environmental and performance concepts that will help guide the agency’s aeronautics research over the next 25 years. Known as “N+3” to denote three generations beyond today’s commercial transport fleet, the research program is aimed at identifying key technologies, such as advanced airframe configurations and propulsion systems, that will enable greener airplanes to take flight around 2035. MIT was the only university to lead one of the six U.S. teams that won contracts from NASA in October 2008. Four teams — led by MIT, Boeing, GE Aviation and Northrop Grumman, respectively — studied concepts for subsonic (slower than the speed of sound) commercial planes, while teams led by Boeing and Lockheed-Martin studied concepts for supersonic (faster than the speed of sound) commercial aircraft. Led by AeroAstro faculty and students, including principal investigator Ed Greitzer, the H. Nelson Slater Professor of Aeronautics and Astronautics, the MIT team members include Aurora Flight Sciences Corporation and Pratt & Whitney. Their objective was to develop concepts for, and evaluate the potential of, quieter subsonic commercial planes that would burn 70 percent less fuel and emit 75 percent less NOx than today’s commercial planes. NASA also wanted an aircraft that could take off from shorter runways. Designing an airplane that could meet NASA’s aggressive criteria while accounting for the changes in air travel in 2035 — when air traffic is expected to double — would require “a radical change,” according to Greitzer. Although automobiles have undergone extensive design changes over the last half-century, “aircraft silhouettes have basically remained the same over the past 50 years,” he said, describing the traditional, easily recognizable “tube-and-wing” structure of an aircraft’s wings and fuselage. The MIT team met NASA’s challenge by developing two designs: the 180-passenger D “double bubble” series to replace the Boeing 737 class aircraft, currently used for domestic flights, and the 350 passenger H “hybrid wing body” series to replace the 777 class aircraft now used for international flights. The engineers conceived of the D series by reconfiguring the tube-and-wing structure. Instead of using a single fuselage cylinder, they used two partial cylinders placed side by side to create a wider structure whose cross-section resembles two soap bubbles joined together. They also moved the engines from the usual wing-mounted locations to the rear of the fuselage. Unlike the engines on most transport aircraft that take in the high-speed, undisturbed air flow, the D-series engines take in slower moving air that is present in the wake of the fuselage. Known as the Boundary Layer Ingestion (BLI), this technique allows the engines to use less fuel for the same amount of thrust, although the design has several practical drawbacks, such as creating more engine stress. According to Mark Drela, the Terry L. Kohler Professor of Fluid Dynamics and lead designer of the D series, the design mitigates some of the drawbacks of the BLI technique by traveling about 10 percent slower than a 737. To further reduce the drag and amount of fuel that the plane burns, the D series features longer, skinnier wings and a smaller tail. Independently, each tweak might not amount to much, but the “little 5-percent changes add up to one big change,” Drela said. Although the plane would travel slightly slower than a 737, he said that some of this time could be recovered because the plane’s wider size should allow for quicker loading and unloading. Not only does the D series meet NASA’s long-term fuel burn, emissions reduction and runway length objectives, but it could also offer large benefits in the near future because the MIT team designed two versions: a higher technology version with 70 percent fuel-burn reduction, and a version that could be built with conventional aluminum and current jet technology that would burn 50 percent less fuel and might be more attractive as a lower risk, near-term alternative. Although the H series utilizes much of the same technology as the D series, including BLI, a larger design is needed for this plane to carry more passengers over longer distances. The MIT team designed a triangular-shaped hybrid wing body aircraft that blends a wider fuselage with the wings for improved aerodyamics. The large center body creates a forward lift that eliminates the need for a tail to balance the aircraft. The large structure also allows engineers to explore different propulsion architectures for the plane, such as a distributed system of multiple smaller engines. Although the H series meets NASA’s emissions-reduction and runway-length goals, the researchers said they will continue to improve the design to meet more of NASA’s objectives. The MIT team expects to hear from NASA within the next several months about whether it has been selected for the second phase of the program, which will provide additional funds to one or two of the subsonic teams in 2011 to research and develop the technologies identified during the first phase. The researchers acknowledge that some propulsion system technology still needs to be explored. 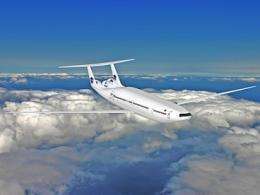 They have proposed evaluating the interactions between the propulsion system and the new aircraft using a large-scale NASA wind tunnel. Even if the MIT designs are not chosen for the second phase, the researchers hope to continue to develop them, including testing smaller models at MIT’s Wright Brothers’ Wind Tunnel and collaborating with manufacturers to explore how to make the concepts a reality. It was about time to make progress on clean airplanes ! Hopefully the developments can be true one day if they put enough money on this. Its good for the environment and for the economy (jobs). "Double bubble, toil and trouble! Airframe tweaked with cabin bubbles!"